Sometimes we apply a label to something because an adequate description doesn’t already exist. For example, Nekst is a sweet bit of programming that manages business processes. But “business processes” is kind of esoteric, and doesn’t sound very “real estate.” So let’s call it transaction management. Mobile phones are now called mobile devices because early adopters are driving new forms of physical device collaboration and functional conglomeration. More for less. Convenience above effectiveness. REthink calls itself a CRM, but it’s not that easily defined. It offers much more. If you happen to be looking for something much more, then please, read on. I’ve made it very clear that CRMs scare me because in their makers’ effort to build the perfect beast, they create a Frankenstein’s monster of well-meaning but dysfunctional parts. I think that REthink CRM might give us all reason to call off the torch mob. 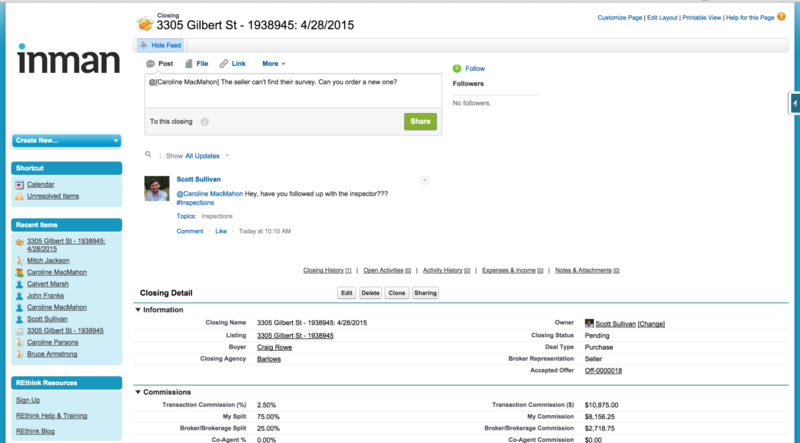 REthink is part marketing tool, part CRM, part office manager. It also handles business automation with handy, customizable action plans (very similar to Nekst) for every facet of a real estate office’s reason for being. 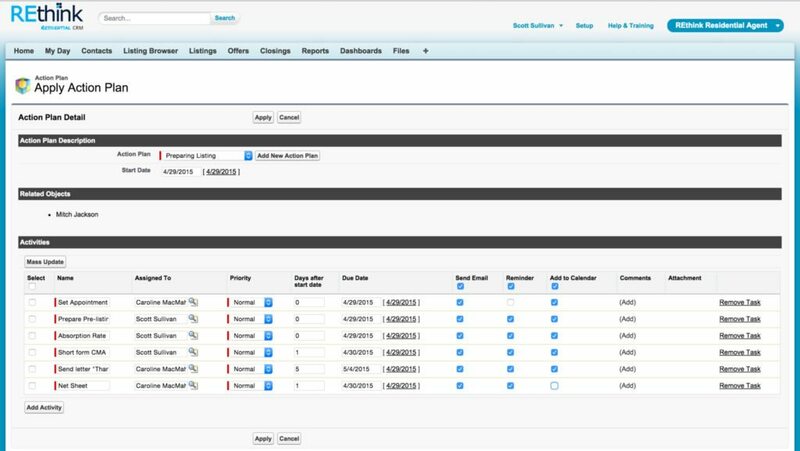 Smaller teams and agencies can benefit by using REthink’s multi-tiered feature set. Although, I see the most value in its intrinsic overlap of disparate business functions that would appeal to managing a large number of processes, making it more suited for bigger firms seeking an enterprise solution, a “one ring to rule them all” type of thing. Users will see a home screen of sorts upon login. Your menu of options is neatly splayed across the top center of the screen, leading you visually over to your App Selector drop-down. From the App Selector, choose whether to interact with the system as a buyer’s agent or listing agent. Brokers and marketing staff have their views, too. It’s all permission-based. The layout exercises iconography and a suitable user interface (UI) to pull users around to key feature silos. Some of the surface visuals are a tad dated; but most importantly, all of the touch points are organized very well — nothing is out of place in a system with many moving parts. Users are neatly presented with a task list, contact access and upcoming events that can be synced from both Gmail and Outlook calendars. You can sort through your Buyer and Listing contacts easily to access what you need to do for each. Through this menu, you can roll out a long-term drip email campaign for a listing that just sold. Or start your prelisting activities. For busy marketers, REthink includes templates and some sample email copy, but feel free to customize it for your client. Sort your contacts by lead quality, buyers, sellers, most often contacted, or however you’d like to parse them. A slick bit of programming reveals itself when you choose contact type. Contact classification is all customizable. 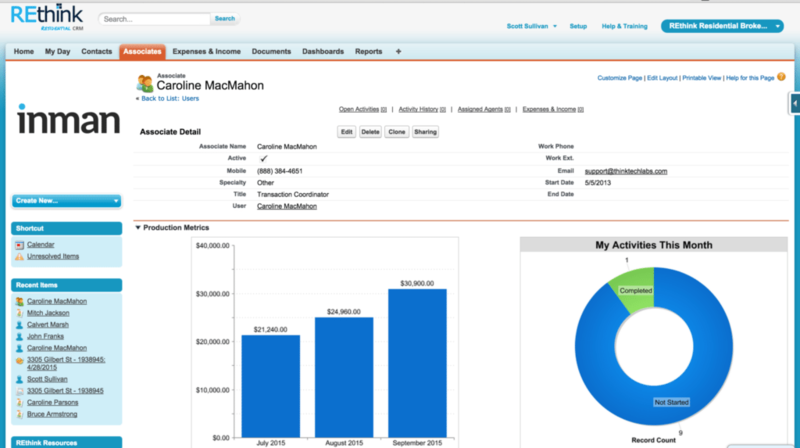 Since REthink is based wholly on Salesforce, the contact management and richness of the relatable databases are proven powerful. In other words, the chassis is sound. When you enter a new buyer contact’s home preferences, REthink automatically delivers a list of current matches from your MLS connection. When viewing buyer contacts, users are presented with workflow options that relate only to buyer representation, like arranging property tours and viewing just listeds. Same goes for seller contacts. Agents can build a quick market survey to email customers, along with a Google Map tour that includes nearby amenities. It can also be delivered via PDF. This process-specific functionality is an intuitive way for the software to lead you through what drives your day; and it makes REthink stand out from other “CRMs.” You don’t just open it to find a phone number. It’s smart to not make an individual contact the center of workflow. Instead, REthink focuses first on the business process. Thus, it helps agents be better business managers. REthink’s Chatter tool is an ever-present method of internal talk that can avoid the back-and-forth confusion of managing transactions via email. You can hashtag conversations based on property or person to hasten solutions. There’s also a systemwide search tool placed on the top of every screen that scans not just contacts, but everything in the system. If you choose to hook up an MLS feed, do all of your market surveys directly in REthink. Again, this avoids having to interact with multiple software products to gain information required to go about your day. 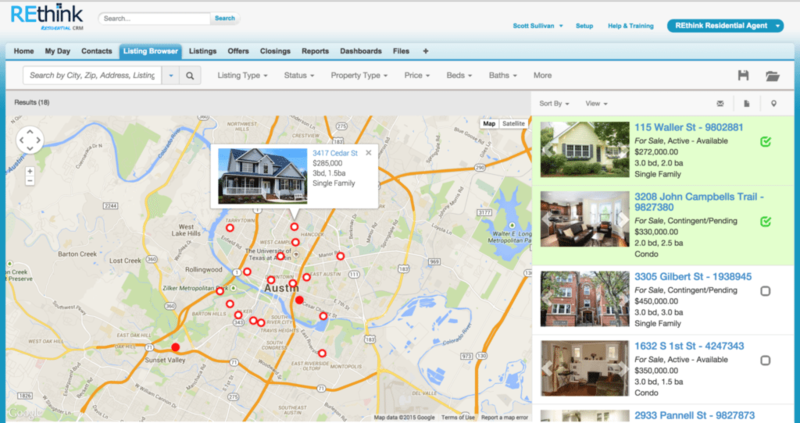 REthink is a very organized, practical and clearly real estate-centered business software solution. It can help you market, help brokers manage agents, and help agents manage clients. Its mobile version is equally sharp and robust, so expect much of the same. It also has a comprehensive reporting mechanism for a range of measurables, such as closings, estimated annual revenue, commissions paid, etc. There’s always more to the software I review (well, in most cases) than what my word count and appreciation of your time allows. Rest assured, the rest of what I saw in REthink looks good, too. Do you use REthink CRM? What do you think? Leave a comment and let us know!